Jacek Malczewski (1854–1929), The Artist and The Chimera (1906), oil on canvas, dimensions not known, Muzeum Narodowe w Warszawie, Warsaw, Poland. Wikimedia Commons. Unless you happen to have studied Symbolism, or have visited galleries in Poland or the Ukraine, you are most unlikely to have seen the amazing paintings of Jacek Malczewski (1854–1929). He was born in Radom, a city to the south of Poland’s capital Warsaw, when it was controlled by the Russian Empire. He moved to Kraków at the age of 17, and trained there in the School of Fine Arts. In 1876 he went to Paris, and studied for a year at the École des Beaux-Arts with Henri Lehmann, also attending the Académie Suisse. When he returned to Poland in 1879, the country had been partitioned. He based himself in Kraków, visiting Paris, Munich and Vienna fairly regularly until the First World War, as well as making two trips to Italy, and an archaeological expedition to Greece and Turkey. He served as Professor in the Academy of Fine Arts in Kraków from 1897 to 1900, and again from 1912 to 1921. His paintings were exhibited and attained high recognition in many international salons, including those of Berlin and Munich in 1892, and in Paris in 1900. Jacek Malczewski (1854–1929), Melancholia (1890-4), oil on canvas, 139 × 240 cm, Muzeum Narodowe w Poznaniu, Poznań, Poland. Wikimedia Commons. 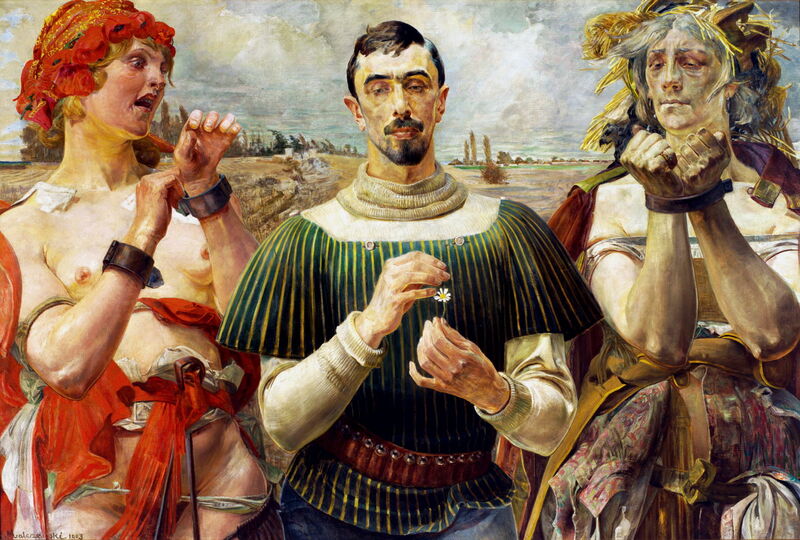 Melancholia (1890-4) is one of Malczewski’s greatest and most brilliant works, in every sense. Its dense parade of figures streaming across the studio summarises the struggles of the Polish people over the previous century’s succession of partitioning and uprisings. This cornucopia of figures contains the heights of heroism and aspiration, and depths of suffering, but eventually sinks into the lethargy and apathy which developed during the late 1800s. Jacek Malczewski (1854–1929), Thanatos (1898-9), oil on canvas, 45 × 57.5 cm, Muzeum Narodowe w Warszawie, Warsaw, Poland. Wikimedia Commons. 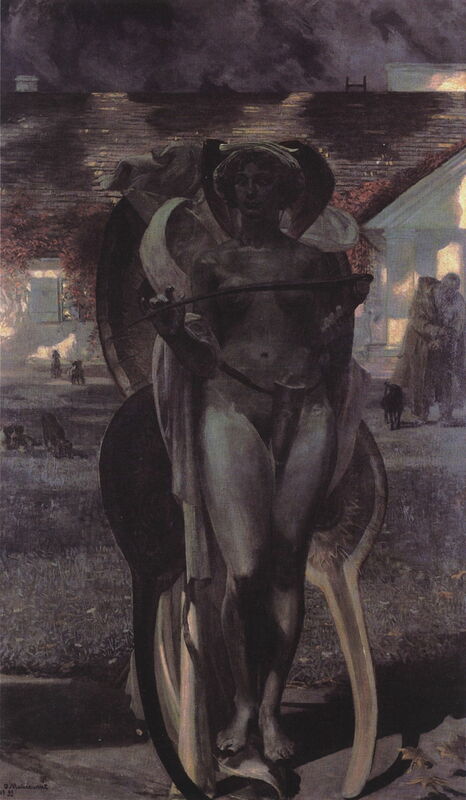 In the years around the turn of the century, Malczewski worked and reworked the theme of death in a series of paintings, of which Thanatos (1898-9) was the earliest. Here, the Greek myth has been revised completely from its traditional male guise. The figure of death is a young woman, still bearing her symbolic scythe, but closely allied with Eros. Naked under her scant scarlet robes, she sizes up an old man who is cowering at his window. Jacek Malczewski (1854–1929), Thanatos II (1899), oil on canvas, 124 × 73 cm, Muzeum Sztuki w Łodzi, Łódź, Poland. Wikimedia Commons. His next examination of the theme, Thanatos II (1899), takes place under the cold moonlight of the artist’s mansion in Gardzienice. Holding her scythe, Thanatos has regained her traditional wings, which seem more butterfly than bird. Behind her the mansion looks to be burning, figures and several dogs gathered on the lawn in front of it. Jacek Malczewski (1854–1929), Death (1902), oil on canvas, 98 × 75 cm, Muzeum Narodowe w Warszawie, Warsaw, Poland. Wikimedia Commons. Then in Death (1902), her skin assumes the ghastly green of the putrefying corpse, as she closes the eyelids of a figure of the artist himself. 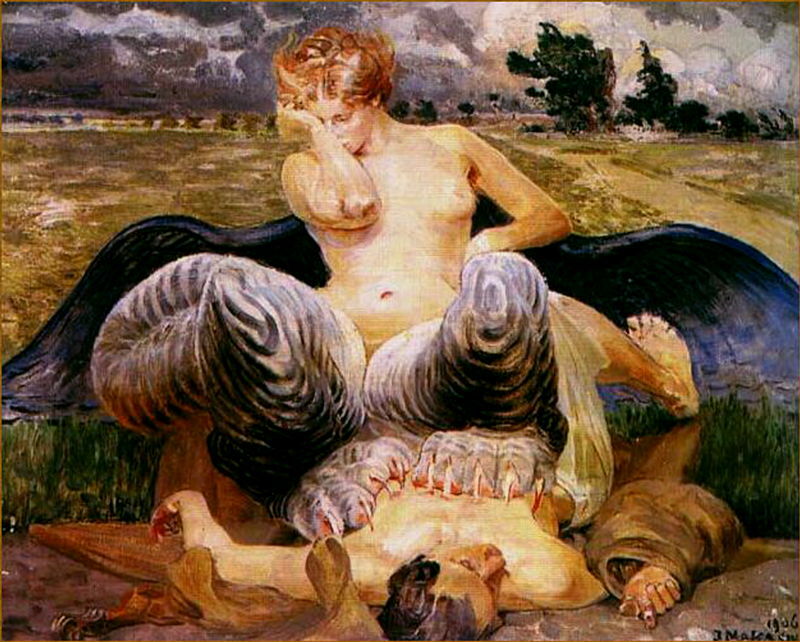 Jacek Malczewski (1854–1929), Medusa (1900), oil on canvas, 48 × 63 cm, Lviv National Art Gallery, Lviv, The Ukraine. Wikimedia Commons. 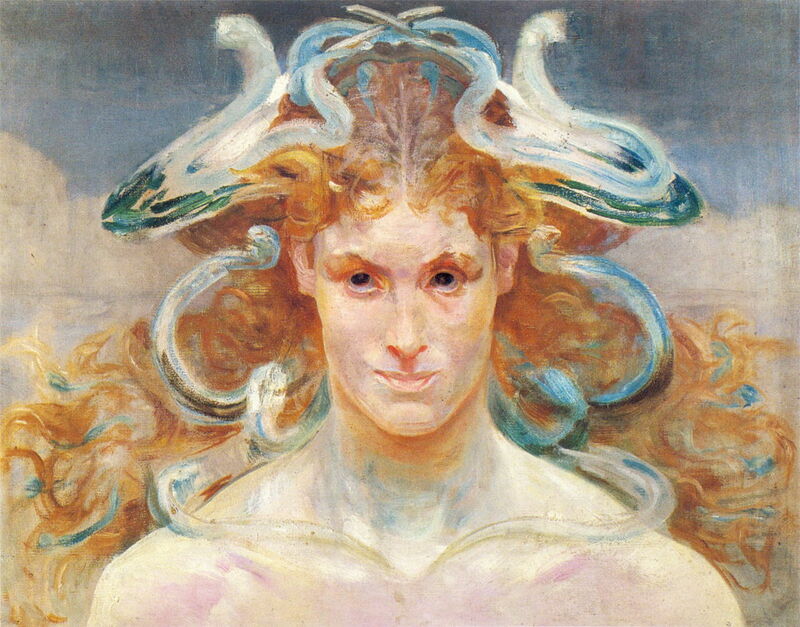 Medusa (1900) shows another recurrent theme, that of the Gorgons from Greek myth. Here the snakes which adorn Medusa’s hair curl and sweep in symmetry, amid more natural locks. Jacek Malczewski (1854–1929), Portrait of Tadeusz Błotnicki with Medusa (1902), oil on oak, 46 x 37.5 cm, Muzeum Narodowe w Warszawie, Warsaw, Poland. Wikimedia Commons. 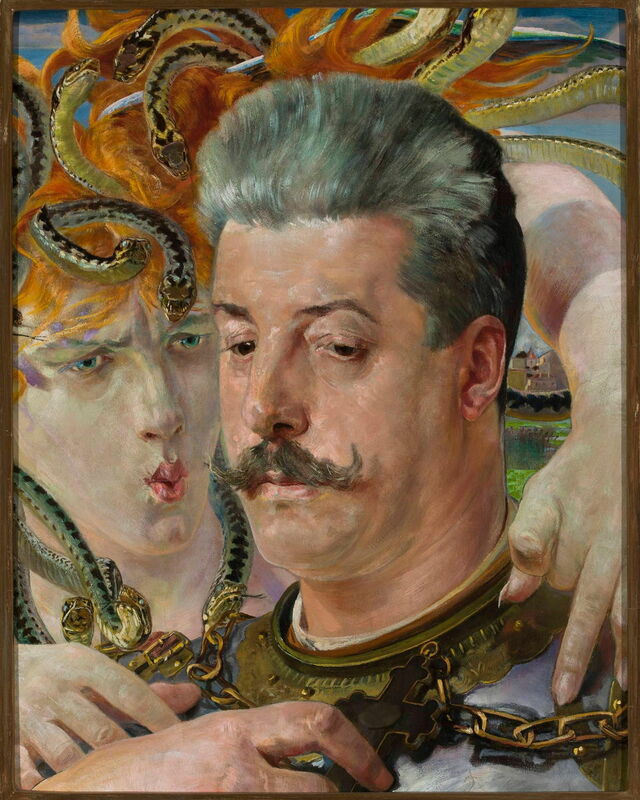 In his Portrait of Tadeusz Błotnicki with Medusa (1902), Malczewski combines the image of his contemporary and friend, the distinguished Polish sculptor Tadeusz Błotnicki (1858-1928), with an attending Medusa. 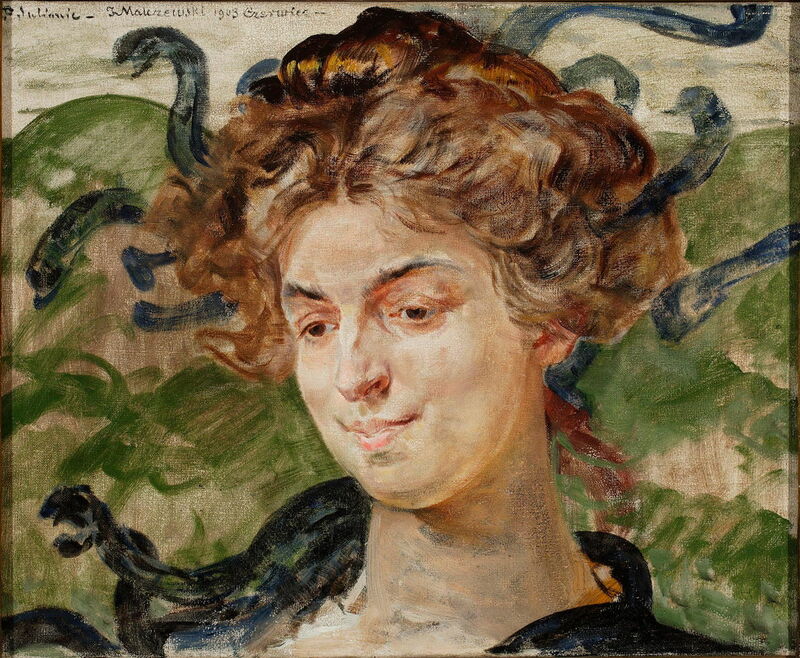 Jacek Malczewski (1854–1929), Portrait of The Actress Helena Sulima as a Gorgon (1903), oil on canvas, 40 x 50 cm, Muzeum Narodowe w Warszawie, Warsaw, Poland. Wikimedia Commons. Portrait of The Actress Helena Sulima as a Gorgon (1903) is another unusual portrait, this time casting its subject in the role of Medusa or one of her sister Gorgons. Helena Sulima (1882-1944) had already become a successful actress in Polish theatre, and in 1912 debuted in her film career, which was to last until the outbreak of the Second World War. Jacek Malczewski (1854–1929), Angel, I will follow you (1901), oil on cardboard, 34.5 x 28 cm, Muzeum Narodowe w Warszawie, Warsaw, Poland. Wikimedia Commons. 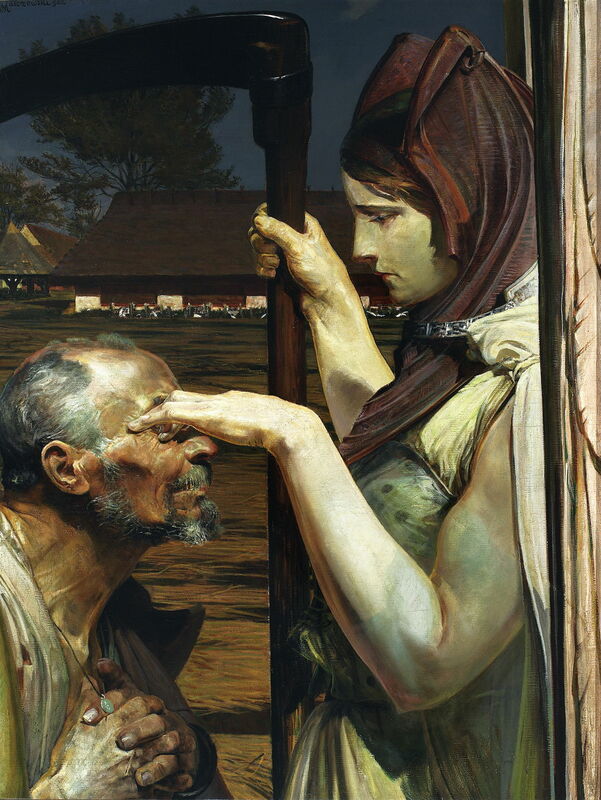 Malczewski painted a series of works showing scenes from the Old Testament story of Tobias, the son of Tobit, taken from the Book of Tobit. 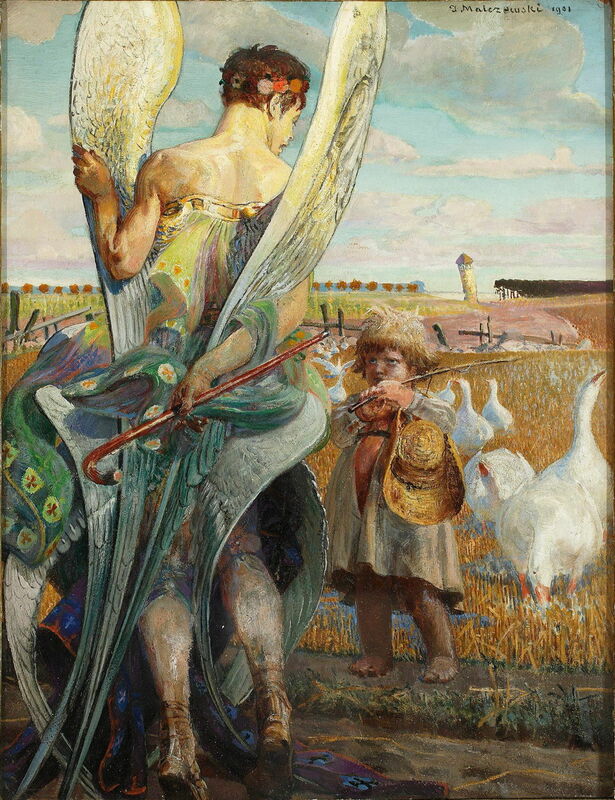 The first, Angel, I will follow you (1901) shows Tobias as a young boy meeting his guardian angel. Although largely forgotten now, this story had been painted by Verrocchio, Filippino Lippi, and the Pollaiuolos in the past. Jacek Malczewski (1854–1929), Polish Hamlet – Portrait of Aleksander Wielopolski (1903), oil on canvas, 100 × 148 cm, Muzeum Narodowe w Warszawie, Warsaw, Poland. Wikimedia Commons. Polish Hamlet – Portrait of Aleksander Wielopolski (1903) is an incisive political commentary on the career of Aleksander Ignacy Jan-Kanty Wielopolski (1803-1877), who was head of Poland’s civil administration under the Russian Empire, from 1862 to 1863. An aristocrat and conservative, he was sent to London to try to obtain the assistance of the British government during the 1831 November Uprising in Poland. He then wrote a controversial letter responding to the Galician massacres in 1845, and tried to stop the growing Polish national movement in 1863. 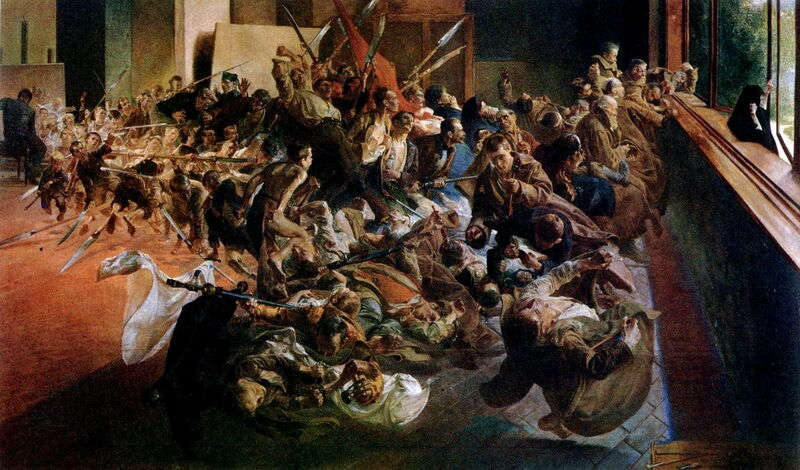 However, in forcing the conscription of young Polish men into the Russian Army, he provoked the January Uprising of 1863, which forced him to flee into exile in Dresden. I believe that Wielopolski is here shown in the role of Shakespeare’s Hamlet, with Ophelia at the left, and Gertrude, Hamlet’s mother, at the right, the two women representing the Polish nation. 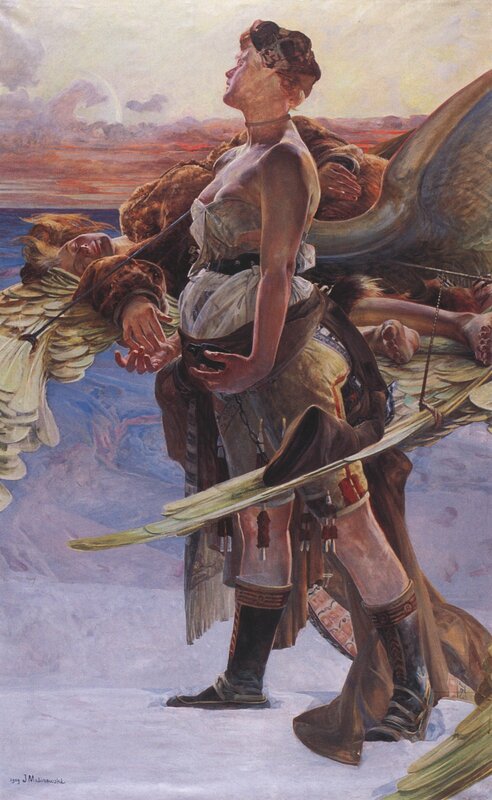 In his The Artist and The Chimera (1906), Malczewski returns to his innovative re-interpretation of classical Greek mythology. His chimera is part woman, part eagle, its fearful claws scratching at the artist’s bare chest as he lies captive under it. Chimeras were a theme in several of his paintings, but were usually less predatory or threatening. Jacek Malczewski (1854–1929), Saint Francis of Assisi (1908), oil on canvas, 136 x 201 cm, Muzeum Narodowe w Warszawie, Warsaw, Poland. Wikimedia Commons. 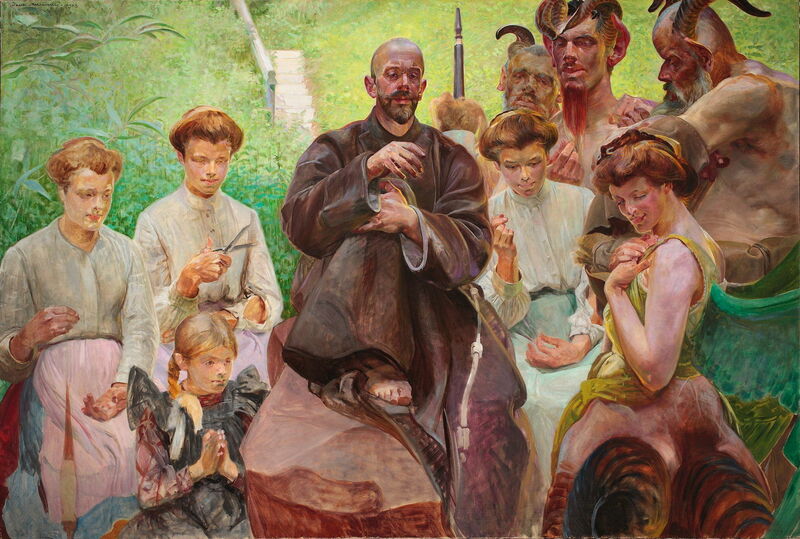 In Saint Francis of Assisi (1908) Malczewski modernises the Fates (Parcae) in this fascinating allegorical portrait, starring the artist in the title role. All three Fates appear similar, with similar clothing, hair, and features. Clotho is at the left, with a pink apron, Atropos holds a modern pair of scissors rather than the traditional shears, and has a light purple apron, and Lachesis is on the other side of St Francis, with a pale blue apron. The right of the painting contains a group of semi-human mythical creatures, rather than the traditional birds and small animals typically associated with this saint. Jacek Malczewski (1854–1929), Eloe (1909), oil on canvas, 205.5 × 129 cm, Lviv National Art Gallery, Lviv, The Ukraine. Wikimedia Commons. Eloe (1909) is a very complex pair of intertwined figures developed from his theme of winged angels. The female stood in the foreground appears to be winged, and there is a recumbent figure behind her, who seems to be resting on feathered wings which girdle the first angel. The symbolism here has perhaps become a little too obscure to be readily interpreted. Jacek Malczewski (1854–1929), Christ and the Samaritan Woman (1911), oil on canvas, dimensions not known, Lviv National Art Gallery, Lviv, The Ukraine. Wikimedia Commons. 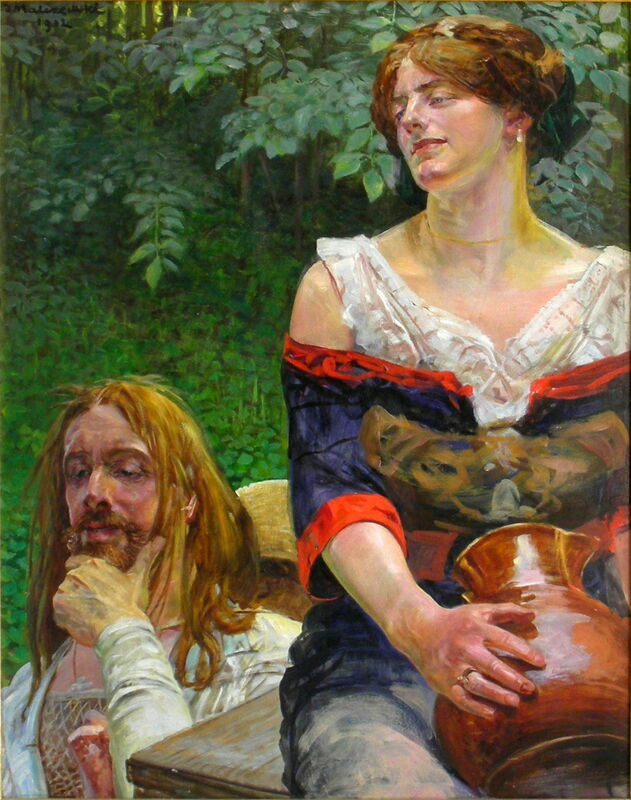 Christ and the Samaritan Woman (1911), which casts Malczewski in the title role, is a simpler composition showing the New Testament story. The model used as the Samaritan woman looks to be Maria Bal or Balowa (née Brunicka), his favourite model and believed to have been his long-term mistress. 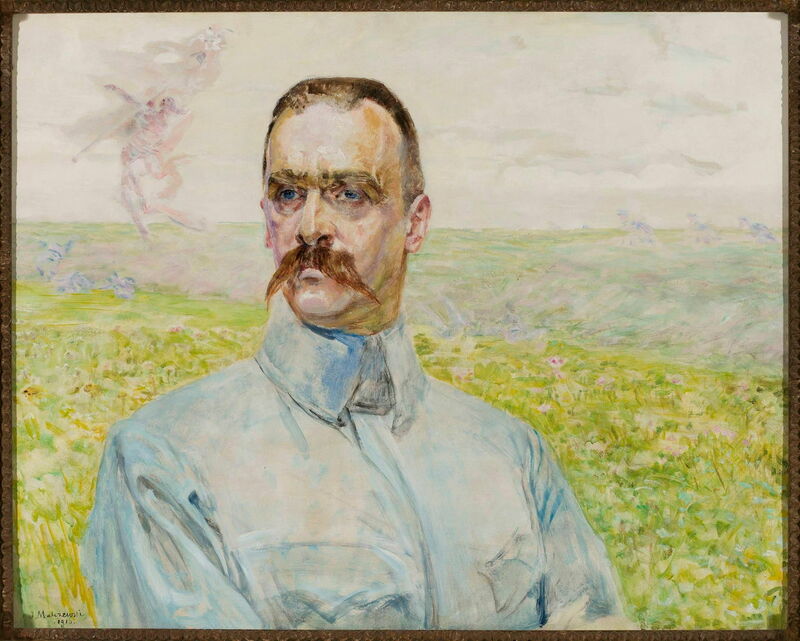 Finally, Malczewski’s Portrait of Brigadier Józefa Piłsudskiego (1916) shows this hero and Chief of State, who was so important in the building of the Second Polish Republic after the First World War. Józef Klemens Piłsudski (1867-1935) was sent to Siberia in 1887 following a plot to assassinate Tsar Alexander III, imprisoned in Warsaw Citadel in 1900 for operating a socialist underground printing press in Łódź, and a leader in the building of Polish military forces in anticipation of the First World War. Behind the image of Piłsudski are faint dancing wraiths in the form of skeletons. 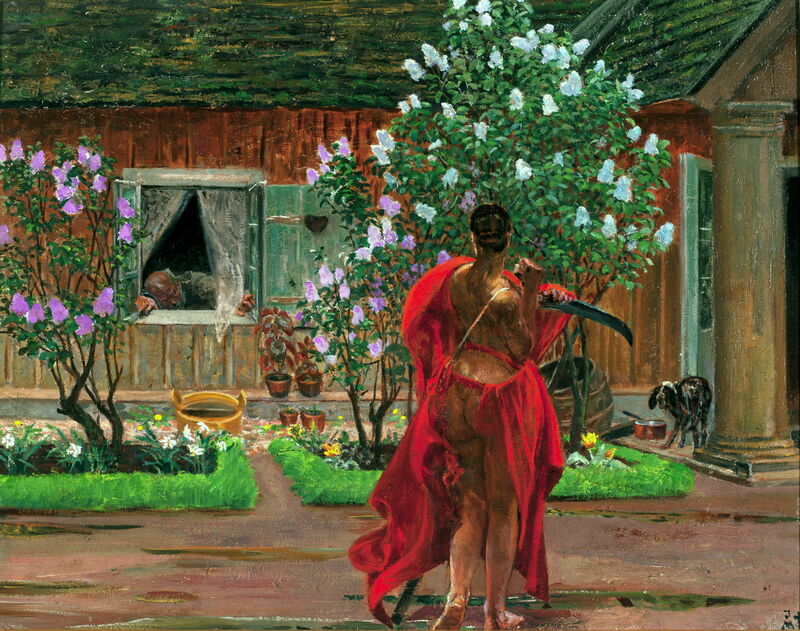 This is a tiny sample of Malczewski’s extensive works which I hope gives some impression of his brilliant and distinctive paintings, and his importance in Symbolism. Search the major collections outside Poland, though, and you will be very lucky to find a single work of his: The Tate in London, Musée d’Orsay in Paris, and the Met in New York have not a single work between them. The only places that you are likely to see many of his wonderful paintings are in Poland and the Ukraine. Culture.pl – an excellent account in English. Posted in General, Painting and tagged Malczewski, painting, Poland, symbolism. Bookmark the permalink.